The long-awaited return of the Green Hornet & Kato and their rolling arsenal the Black Beauty! 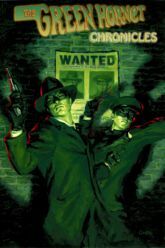 Moonstone is proud to present The Green Hornet Chronicles, the first anthology featuring all-new, original crime fiction tales of the man who hunts the biggest of all game, public enemies that even the FBI can�t reach! This limited edition hard cover includes a story fragment by Harlan Ellison (as he teams the Green Hornet up with The Phantom), a new story by noted writer Ron Fortier, an introduction by Van Williams (TV�s Green Hornet), an afterword by Dean Jeffires (the man who designed and built the Black Beauty), a story by Denny O'Neil (based on an unaired Green Hornet radio script), plus so much more! Written by: Harlan Ellison, Greg Cox, Robert Greenberger, Ron Fortier, Will Murray, and more!